Sage have just made product update 1 for Sage 100 and Sage 100c version2017 available. Many users wait to install new releases until the first product fix has been released. With this update, we expect more users will now be comfortable installing Sage 100 2017. 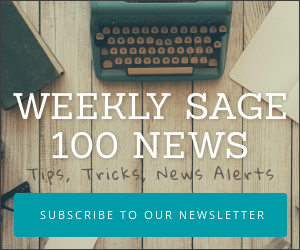 The update applies to both Sage 100 and Sage 100c. The 1099 Electronic Consent Signed is required message no longer occurs when selecting Accept after a change to Vendor Maintenance. Issue only occurred after migrating and converting data from 4.50 or earlier. The debit amount no longer displays under the Beginning Balance column when the General Ledger Detail Report is printed in the condensed format. The debit amount now correctly displays under the Debit column heading. Error: “Sage 100 has stopped working” no longer occurs when remote desktop user logs into Sage 100c 2016 using “Standard” desktop view in Terminal Services. Classic theme launcher no longer hangs when user receiving broadcast message tries to access launcher tasks prior to clicking the ‘OK’ button at the broadcast message. The Classic launcher is now locked until the user clicks ‘OK’.